I don't know about you but harvesting your own crop drew great satisfaction. During my illness, most of my plants died on me. The only survivor was the chilli padi plant and the roselle plants. In fact, I think my chilli padi now is sick as well as it is infested with aphids. Darn... really hated these little bugs. My friend LM and her hubby, T came to visit me last weekend and she told me that my chilli padi is the Indonesian type which is small. So I really hope to save it. Now I am spraying it with all sorts of non chemical deterrent like neem oil, vinegar and now canola oil! Can't believe it? They are still around. I really hope I don't have to chop down this little fella. Let's watch over it carefully. On a happier note, my roselle is growing beautifully. In fact, it has grown so tall that I have to get it shifted down into the helconia bed (which didn't materialise). See how pretty this flower is. Unfortunately it only lasted a few hours as it will wilt under strong sun. I didn't know that these ruby red fruits can be made in jam besides boiling it as drinks. I used to buy these dried fruits from the medical hall as my son loves this drink. It is loaded with lots of Vitamin C as well. Actually while bed ridden, I read a Roselle Jam recipe from a blog but somehow, I guess I was too sick and the name of the blog didn't register in me. Thus I have to surf again for a recipe. Lastly, the leaves of this plant can also be eaten. CC told me that the Burmese cooks this with meat. I shall try another day and let you know its taste. Nothing goes to waste. Awesome! Now back to what I had done today. I love having visitors. I wish I have the energy to bake more goodies to offer to my guests but today, I really needed to sum up my energy to get by the day. You see, my girl was down with a fever yesterday. Being the paranoid mom, yes I am paranoid about fever because I have two uncles who suffered badly after a high fever outbreak when they were young. One of them turned deaf and the other got brain damaged. Now can imagine how I feel when my kids have fever. Luckily, it was just a mild fever but I still only get about 3 hours of sleep. Waking up constantly to check on her and trying to make her "sweat it" out. Yes old traditional method that some might think I am crazy but I swear that this method works really well on my kids and even myself. My son is really easy to take care when he is sick. He will not defy yucky bitter chinese herb drinks, he will be obediently accept that he has to cover thick blanket and sleep without fan to just ot sweat it out. After 2 - 3 change of clothings, he will be well enough to run around again. As for my daughter, oh, she is a total complete opposite! Feeding her medication is a time consuming action. From sweet talking to getting a stern tone, only then she will take her medication. You can cover the blanket and she will kicked it off the next moments, so it will be numerous time you need to repeat this action. Thus for her to get well, it takes a longer time. Nevertheless, I am glad that she is feeling a better today and she was able to enjoy the company of her young visitors while mommy was catching up with her friends, H and L.
This is what we had for our tea. I turned the Roselle Jam into Roselle Buttercream for our Almond Cupcakes. I am so happy that both H and L love it. Personally I find it a good balance between the sourish tone, the sweetness as well as saltiness as I used salted buttercream which really pairs really well with the Roselle Jam. The Almond Cupcake was also very nice. The method is my first and I am really pleased with the results! Preheat oven to 180 deg. Lined cupcake pan. Beat 1 cup of sour cream, butter and oil together. In another bowl, sift the flour, baking powder, baking soda and salt. Stir in the almond flour and sugar. Add the dry ingredients to the creamed sour cream mixture. 1/3 at a time. Mix thoroughly after each add on. In another bowl, mix the eggsm, remaining sour cream and vanilla essence together. Add the egg mixture into the batter in thirds. Beating well after each addition. Fill in the cupcake pan to 3/4 full. Bake for approx 20 - 25 min or till cooked. 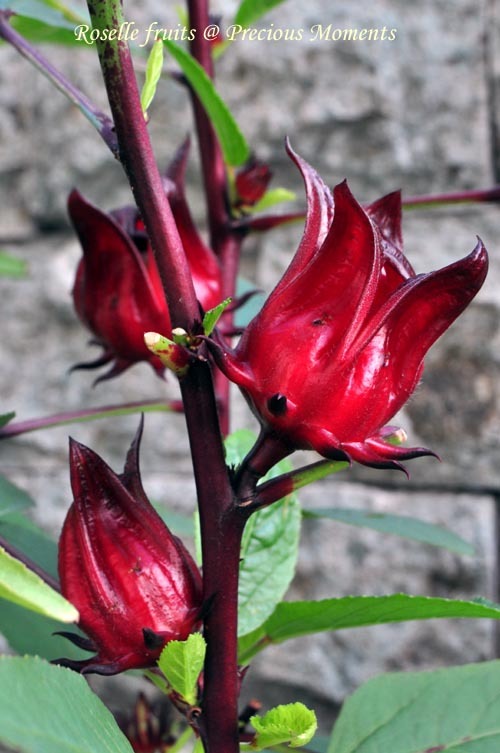 Put 2 cup of water and roselle petals in a pot and bring to a boil. Approx 5 mins till petal is softened. Strain and pour the water back into the pot. Add honey or sugar and stir till sugar melted. Serve as drinks. Pour the other ½ cup of water with the soften petals in a blender and blend. If you like some bites, just a quick pulse. Alternatively you can chop then finely. Put the “puree” roselle and sugar into a pot and bring to a boil. (you can taste and add sugar accordingly). Lower heat and simmer till the puree become jam like. Keep stirring to avoid burnt. Store jam in sterlised glass jar and chill in fridge once cooled. Add in icing sugar and whipping cream and continue to beat till light and fluffy. Add in roselle jam and continue to beat till well incorporated. Oh, you love having visitor? Can I come for tea? 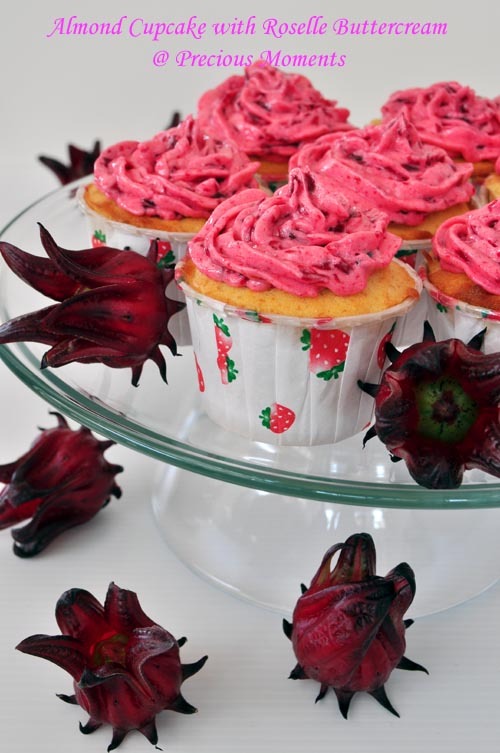 Any more cupcakes left as I am sure this is very yummy with that topping. Since you said it is a keeper, I should bake this too! 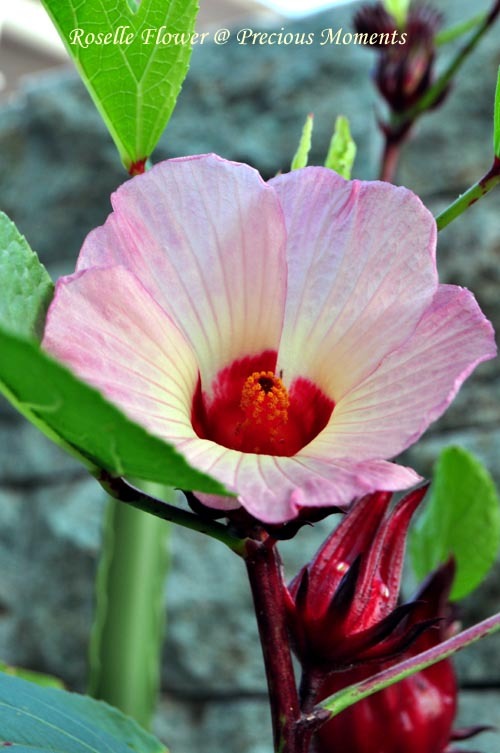 didnt know the flower of roselle is so pretty.